For all the metaphysical and neurophysiological bellybutton gazing that goes on in Inception, the story is just an old-fashioned heist, albeit with a spectacular twist. There are the familiar characters in the scam: the forger, the point man, the mark, the mastermind, and the shadowy powerful figure they all work for. But the con is not to steal anything, but rather to implant an idea in the victim. And the scam happens in several layers of dreams. 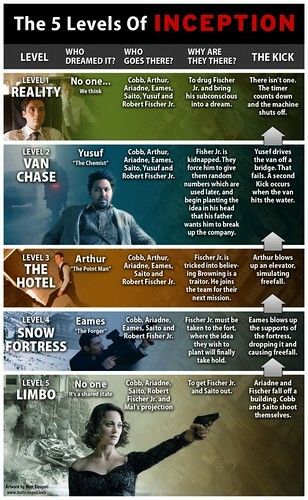 Accordingly several archetypes have been added or modified. There’s the chemist who concocts powerful sleep-inducing drugs. The architect uses the target’s own subconscious to weave the dreamworld to her specifications. The forger is the master of disguises. And the mastermind is an extractor, skilled in stealing memory. There are five levels of reality in this plot. One real and four dreams within each other. Despite the complex plot, I found it easy to follow the storyline. In fact, I found it refreshing to watch a movie that required you to think. Not only did you have to keep track of what’s happening, you had to imagine what might really be happening, then decide how the movie ended. The director, Christopher Nolan, had earlier created a similarly cerebral movie, Memento (2000), in which a man with chronic short-term memory loss tries to keep track of his life by leaving notes tattooed on his body and on his stack of polaroids. By the end, you’re given an approximation of what might have taken place. 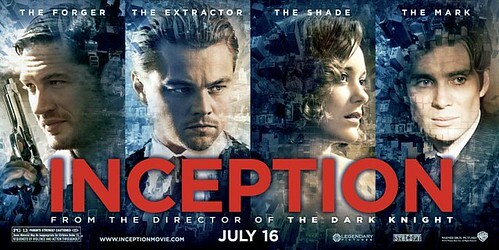 But in Inception, the truth gets murkier and by the end, satisfyingly ambiguous. The story is sufficiently dense enough to inspire a small cottage industry of people trying to make sense of it. 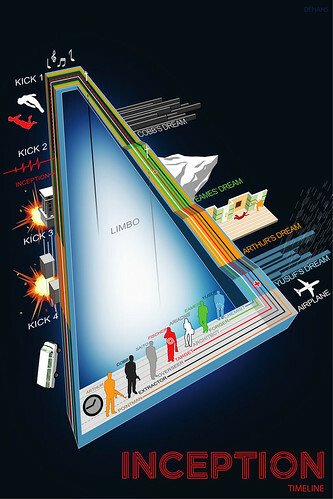 I like this visual schematic of the plot. Or if you prefer, a chart. The Ending within the Ending. I haven’t found any charts to speculate on the possible endings, which to me is much more compelling than the byzantine con game. So here’s my list of the three likeliest conclusions. The Ending is the Reality. This is the happy ending. It’s what we expect Hollywood to deliver and that’s that. It Was All the Extractor’s Dream, Everything. None of Nolan’s films have a happy ending. The ending was TOO perfect. The scene at the end just before the children face the protagonist are repeated throughout the movie, like a recurring dream. The con of implanting an idea is the same ‘crime’ that he committed against his wife. And thus was a way to work through his guilt. Everything Was Real, Except for the Ending. The con happened, but the extractor got stuck in the deepest level of the dream state and is dreaming that he is back in reality. Or maybe, we are not meant to know definitively what is real and what is a dream. Maybe Nolan’s message is that the boundary between the two is more fluid than we think, and they shape each other concurrently, neither holding primacy over the other.